With a recent bad experience at McDonald's and the constantly deteriorating quality of food there, I have been spending a lot of time at KFC's given the lack of options. I find my new haven a tad bit expensive. Neither I am a big fan of their burgers. Will tell you why is that in my next post. But I do like their rice bowls and a couple of drinks they have under the Krushers range. I recently visited KFC with a friend. She suggested we go for Mango Burst. So, we went for a Mango Burst. I was at the counter trying to look at how they made it. I could just see the yellow gel like substance that they added to the glass with a spoon. It was the Mango concentrate. I really couldn't see the next step though. It came in the usual plastic glass with a lid and the straw making it's way through it. I do not know the exact quantity of the contents, because unfortunately the KFC India website is not updated. But it felt like 250-300 grams of sugary Mango goodness. The drink had a bright yellow color. With high expectations in my mind, I sipped on the Mango Burst. And oh boy! What a drink it was! The mango tasted really strong and nice. It had a nice punch. It smelled great. We all know Krushers contains added flavors. But this one managed to taste 80% natural. Yes! 80%! Somehow we tend to know the difference between artificial and real. It had a nice fruity aroma, a bit artificial but pleasant. It was chilled to the appropriate temperature, which had a soothing effect. The texture was grainy from the ice granules. The consistency was pretty thick and I am sure it won't splash around even if you try thumping your glass on the table really hard. Misleading pictorials on the menu I tell you! 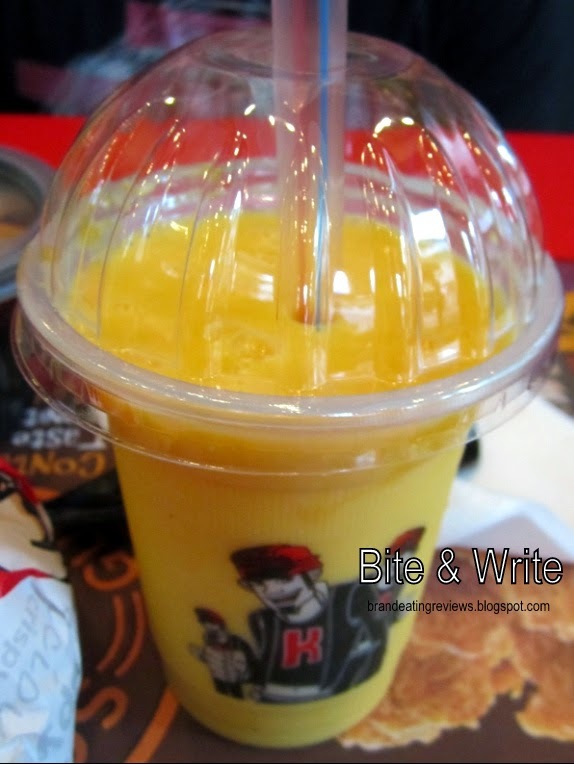 The description mentions that Mango Burst contains yogurt. However, I couldn't get the flavor of yogurt. It was just mango mango everywhere! A natural sour tinge from the yogurt would have been nice. I did love the texture a lot! It was indeed a much-needed break from the usual Coke Floats and Fanta Float at McD. Will I go for Mango Burst again? Well that depends on how I find other Krushers. I am yet to try them.